The current drought conditions in New South Wales and large parts of Queensland are getting a lot of media attention, and of course the usual suspects are linking it to climate change and our apparently “unambitious” emissions targets in the NEG. But are droughts really becoming “the new normal”, and are they becoming more frequent, more intense, and more widespread with global warming? There are two aspects to consider: long term rainfall trends in various regions, and periods of rainfall deficiency. In this post I will look at long term rainfall, and Part 2 will look at rainfall deficiency i.e. drought incidence. Both are true, but both are only half true, and in fact the ABC and the Climate Council as usual lie by omission. The whole story is more complex but shows a completely different, and much less dramatic picture. Using data for cool season (April- September) rainfall from the Bureau of Meteorology we can check on different time periods. Yes, if this is what Paul West based his statement on, 2017 had about 28% less rain than in 1988. I hope he didn’t- comparing single years would be pretty bad science. However there has been a marked decrease in cool season rainfall over this period, so the Climate Council is quite correct. However, Figure 2 shows the big picture- since 1900. The reason for the current gnashing of teeth is that “living memory” only goes back about 70 years, and we are comparing current conditions with those of a few decades ago. Figure 3 shows the average rainfall for the 10 year periods up to 2017. As you can see, the average rainfall of the 10 years 2008 to 2017 was about 7% less than in the 1950s, 1970s, 1980s, and 1990s, but more than the 1920s and 1930s, and nearly 10% more than the 10 years to 1947. Of the 10 decades before this one, five had less rain and five had more. Southern Australian cool season rainfall is not “the new normal”, it is in fact “the old normal”. Let’s now look at South-East Australia, below 33 degrees South and east of 135 degrees East. Again there is an obvious decrease in rain over the last 30 years. There was a decreasing trend up to the 1940s, and a decreasing trend from the 1950s to now. The current 30 to 40 year decrease is nothing new. Fig. 7: Monthly rainfall (all months January 1863 – December 2017) at Penola, S.A. Fig. 8: 12 month running total rainfall (all months January 1863 – December 2017) at Penola, S.A. Fig. 8: 120 month running total rainfall (all months January 1863 – December 2017) at Penola, S.A. This site shows a very long term rainfall decrease, complicated by droughts and strings of wetter years, and a huge step up in the middle of last century. This site is one of many of varying lengths in the High Quality Rainfall dataset. Nearly all show the mid-century step up, some show a small long term increase, some show a small long term decrease. There are a number of long term sites. There were 50 sites in 1898, as in 2017 (several had not yet reported January 2018). Note: the following plots are of naïve means: there is no area averaging. The mid-century step up is obvious, with a decline since then. The 10 year rainfall to December 2017 is about what it was a century ago. I now turn to South West Australia. A very serious decline since 1988. As you can see, the decline has been around since 1900, but with a marked step down starting in 1968, with a steep but uneven decline since then. 10 year averages show this clearly. The long term data show a complex picture of long term cool season rainfall decline in south-west and some parts of south-east Australia, while southern Australia as a whole shows a very small increase. It is true that rainfall has declined, as the Climate Council and ABC claim, over the past 30 and 40 years in many parts, but that is only half the story. The whole story is much less dramatic. Rainfall has been declining for a long time in WA, and in south-east Australia has been declining in two stages, separated by a large step up in rainfall in the middle of last century. The current low rainfall is not “the new normal” but entirely consistent with “the old normal” and should be seen as just plain “normal”. This is Australia. Get used to it. “This is just another example of the unprecedented weather in the last six months,” Mr Roberts said, referring to bouts of wild weather that have hit power supplies hard this summer and the preceding spring. 21mm of rain was measured at the Kent Town gauge. Just how “unprecedented” is Adelaide’s weather over the past few months? I couldn’t find any records for the number of severe storms, so for a proxy I have made do with rainfall data from West Terrace and Kent Town in Adelaide. The overlap period has very similar rainfall recordings so I joined the two series to give a record starting on 1 January 1839. That’s 178 years of data. When thinking about “unprecedented”, we need to check amount, intensity, and frequency. Firstly, a few plots to give some context. How unprecedented was Thursday’s storm? Note Thursday’s rainfall had less rain than four previous occasions on this day alone, and 20 or so in previous Januarys. Note the December storm had extreme rain (for Adelaide) but not a record. Amount and intensity has been higher in many previous years. 141.5mm was recorded on 7 February 1925. The topmost dot shows the maximum 7 day average for each year. 2016 got to 13.4mm on 4 October- multiply by 7 to get the weekly total rain. Note there were many wet and dry periods all through the record. 21mm of rain fell in a severe storm on Thursday, so I arbitrarily chose 20mm as my criterion for heavy rainfall in one day as a probable indicator of stormy weather. I am the first to admit that 20mm might fall steadily all day and not be at all associated with wild winds, and wild winds can occur without any rain, but bear with me. There seems to be no increase in amount or intensity of rain at any time of the year. Note 2016 had 7 days with above 20mm in 24 hours. That’s the most since… 2000, when there were 8 days- and many previous years had 7 or 8 days, and 1889 had 9. So no increase in frequency. 1973, 1978, and 1992 had the same or more days with over 20mm. Not unprecedented: 1992 had one more. Add in last Thursday’s event to make them equal. Adelaide has a long climate record, showing daily rainfall has varied greatly over the years. There is no recent increase in amount, intensity, or frequency for the whole year, or for the last six months or four months. Spring and summer rainfall in 2016 was not unprecedented, and to the extent that spring and summer falls over 20mm are a proxy for storms, there is no evidence for an increase in wild weather. This is normal. Get used to it, Mr Roberts, and make sure the electricity network can cope. This year, the south-west of Western Australia has recorded some unexpectedly low temperatures. Has this been due to rainfall, cloud, winds, or the cooler than normal Leeuwin Current and Sea Surface Temperatures in the South West Region? In this post I examine maximum temperature and rainfall data for Winter in South-Western Australia, and Sea Surface Temperature data for the South West Region, all straight from the Bureau of Meteorology’s Climate Change time series page . All temperature data are in degrees Celsius anomalies from the 1961-90 average. Figure 1 is a map showing the various Sea Surface Temperature monitoring regions around Australia. Again, related: both have strong warming from the 1970s. Next I check for whether there was a real change in direction in the 1970s, and if so, when. To do this I use CuSums. Note the major change at 1968 (a step down: see Figure 3), another at 1975 with increasing rain to the next change point at 2000, after which rain rapidly decreases. 100mm more rain is associated with about 0.5C lower TMax, but R-squared is only 0.22. A one degree increase in SST is associated with more than 1.1C increase in TMax, and R-squared is above 0.51- a much closer fit, but still little better than fifty-fifty. TMax is affected by rain, but more by SSTs. I now look at data since the major change points in the 1975 winter. The next three figures show trends in SST, Rain, and TMax. Warming since 1975 of +1.48C/ 100 years. Decreasing since 1975 at 89mm per 100 years (and much more from 2000). Warming since 1975 at +2.14C per 100 years. Detrending the data allows us to see where any of the winters “bucks the trend”. In the following plots, the line at zero represents the trend as shown above. Note that SST in 2016 is just below trend, but still above the 1961-90 average. Rainfall is only slightly above trend, and still below average. However TMax is well below trend, and well below average, showing the greatest 12 month drop in temperatures of any winter since 1975. Maximum temperatures in winter in Southwestern Australia are affected by rainfall, but to a much larger extent by Sea Surface Temperature of the South West Region. The large decrease in winter temperature this year cannot be explained by rainfall or sea surface temperature. Cloudiness may be a factor, but no 2016 data are publicly available. Stronger winds blowing from further south may be responsible. In my last brief post I showed how Diurnal Temperature Range is related to rainfall in Northern and Southern Australia in Northern and Southern wet seasons (which correspond roughly to summer and winter). In this post I show the relationship between DTR and daytime cloud, and between rainfall and daytime cloud, and something very peculiar about South-Western Australia. All data are taken straight from the Bureau’s Climate Change Time Series page. DTR is affected by rainfall through Tmax being cooled by cloud albedo, evaporation and transpiration, and Tmin warmed by night cloud and humidity. There must be a relationship between clouds and rain, although it is (rarely) possible to have rain falling from a clear sky with no visible cloud. Rain is easily measured in standard rain gauges. Cloud is calculated by trained observers, and we only have data for 9 a.m., 3 p.m., and daytime cloud. The data give no indication of cloud type, thickness, or altitude, just amount of sky covered (in oktas, or eighths). Here I show scatterplots for Australia as a whole annually, and for Northern, South-Eastern, and South-Western Australia in summer and winter. I calculate both rainfall and cloud as percentage differences from their means. Notice much better correlation between DTR and Cloud. Now let’s look at the relationship between rainfall and daytime cloud. Note a 10% increase in cloud cover could be expected to be associated with a 25% increase in rainfall. Note how rainfall in the North Australian dry season varies proportionally more, but has a slightly lower correlation (>0.8 vs 0.9). Note the much greater effect of cloud on rainfall in the southern dry season. Now, get ready for a surprise. What’s going on in the south-west? Similar relationship to everywhere else. And this graph clearly shows the relationship between rain and cloud is closer in the wet seasons, but also clearly shows that South-west Australia is an extreme outlier. Why the huge difference? There is no relationship between cloud and rain in south-west Australia, unlike everywhere else. The South-West has seen a marked decline in rainfall since the late 1960s, but an increase in cloud cover. It seems counter intuitive, but there you go. I’ve been looking at DTR and rainfall relationships for Northern and Southern Australia. I’ve also analysed them by winter and summer (southern and northern wet seasons). I’ve used a different approach. Instead of comparing DTR with rainfall anomalies (differences from the mean) I’ve converted these to percentage differences from the mean rainfall. Data are from the BOM climate change page, so DTR is based on Acorn. DTR before 1950, and especially before 1932, may be suspect. However the data are useful for this comparison. DTR which is supposed to decrease as a fingerprint of greenhouse warming, is strongly related to rainfall variation. There is an unexplained increase in DTR around 2001. In the time series plots below, rainfall has been inverted, so ‘up’ is dry and ‘down’ is wet. The rainfall anomalies are expressed as percentages difference from the mean and scaled down by 50. Now comparisons during northern wet season (November to April, basically summer), and southern wet season (May to October- winter and spring). Notice that Southern Australian winters dominate DTR. The impact of rainfall on DTR in Southern Australian winters is twice that in Northern Australian winters, and correlates better as well. Also note that Southern summers have very slightly higher DTR change per rainfall change and slightly better correlation than Northern. No doubt you realise winters up here can’t really be compared with southern winters, being mild and very dry. In many places it is not very difficult to double the mean rainfall in winter with not many millimetres of rain, and zero rain for many months in winter is not unusual. This plot shows Cusums of DTR and inverted, scaled rainfall. The turning points line up exactly, including 2001. There is no visible unusual change in 2001. There are however times when the Cusums diverge: 1932, 1958, 1985, and 2003 and 2011. DTR is strongly related to rainfall variation, especially in southern Australia in winter. There is no unexplained increase in DTR in 2001. UPDATE: PLEASE NOTE UAH DATA FOR THIS POST ARE FROM 6.0 BETA 4. BETA 5 WILL GIVE DIFFERENT RESULTS. It was two years ago in 2013 that I last posted on the difference between climate scientists’ expectations and reality, so in this series of posts I bring these points up to date, and add a couple of related points. • a pattern of cooling in the high atmosphere (stratosphere) with simultaneous warming in the lower atmosphere (tropopause). In this post I look at whether there is a pattern of greater warming in winter than summer. Winters (which are mostly night) are cooling much faster than summers. In Australia overall however, winters are warming faster than summers. This shows a particularly strong summer warming effect. Note the long term slow decrease to 1973, the wet 1970s and dry 1980s, and all except 6 wetter than average seasons since 1991. By contrast, the South Western rainy season shows a long term slow increase with great variability until the 1960s, with a sharp step down in 1969, and another in 2001, with less year to year variability. While the IPCC and its acolytes in the Climate Council predict less rainfall for southeastern and southwestern Australia, this would not be difficult given the trend for southwestern Australia had been established for 20 years before the IPCC was even formed, and 45 years before AR5. Northern Australian rainfall is not mentioned. Assessment of this evidence for the enhanced greenhouse effect: FAIL. Tropospheric data show this to be falsified in both Hemispheres and both Poles. Australia appears to go against this pattern, but drastic changes in rainfall patterns in the Northwest and Southwest appear to be involved in the difference between north and south. Theory has been mugged by reality yet again. I have recently shown how the difference between surface maxima for Northern Australia and Temperature of the Lower Troposphere (TLT) for Australia as a whole is very largely due to rainfall variation in the Northern Australian region alone. Now I turn to comparison with another region: that of Tropical Land. All but six degrees of Latitude of the Northern Australian region is in the tropics, so most of it will be covered by TLT for Tropical Land. How much influence does Northern Australian rainfall have on the difference between Northern Australian surface maxima and TLT for all land in the tropics around the globe? Considering that the Tropical Land TLT measures temperature above large tracts of Africa, South Asia, and Central and South America as well as tropical Australia, this result is amazing: on a decadal timescale, Northern Australian rainfall variation alone accounts for the same proportion of the surface- tropospheric difference of northern Australia surface maxima- Australia TLT as northern Australia surface maxima- tropical land TLT. Surface temperatures cannot be understood separately from rainfall, and especially tropical rainfall. We can also conclude that as the decadal comparison of North Australian rain and surface-atmospheric differences have similar results for both Australia and Tropic Land datasets, UAH Version 6.0 represents TLT in various regions very well. Further, if the rest of the world’s tropical land areas behave as Australia does, then the world’s climate is dominated by tropical rainfall. Why Are Surface and Satellite Temperatures Different? Many are puzzled by the difference between surface temperature, measured in Stevenson screens, and atmospheric temperature, as measured by satellites. Some sceptics suspect surface temperatures cannot be trusted; some global warming enthusiasts claim satellite data are not accurate. The truth is both are accurate enough to be useful for their own purposes. But why the difference? I have used data from the Bureau’s Climate Change Time Series site for monthly rainfall and surface temperatures for Australia, and from University of Alabama-Huntsville (UAH) for Temperature of the Lower Troposphere (TLT) anomalies for Australia, from December 1978 to October 2015. I converted rainfall and surface temperatures to anomalies from monthly means 1981 – 2010, the same as UAH. Throughout I use 12 month running means. Firstly, surface temperatures are supposed to be different from atmospheric temperatures. Both are useful, both have limitations. The TLT is a metric of the temperature of the bulk of the atmosphere from the surface to several kilometres above the whole continent, in the realm of the greenhouse gases- useful for analysing any greenhouse signals and regional and global climate change. Surface temperature is a metric of temperature 1.5 metres above the ground at 104 ACORN-SAT locations around Australia, area averaged across the continent- useful for describing and predicting weather conditions as they relate to such things as human comfort, crop and stock needs, and bushfire behaviour. This map shows the location of the Acorn surface temperature observing sites. The scale is in millimetres: divide by about 25 to get inches. Consequently a very large area of Australia is desert, and another large area is grassland with few or scattered trees. Very little of Australia is green for more than a few months of the year. More on this later. Here are 12 month running means of the Bureau’s Acorn maxima and minima since December 1978. Note that minima frequently lags several months behind maxima- which is why mean temperature doesn’t give us very much useful information. TLT approximately tracks surface temperature, but with smaller variation. So what causes the difference between surface and atmospheric temperatures? The culprit is that wicked greenhouse gas, H2O. In the following graphs 12 month mean rainfall is scaled down by a factor of 25, and inverted: dry is at the top and wet is at the bottom of these plots. It is plainly obvious that very wet periods mostly coincide with low maxima, and dry periods with high maxima. 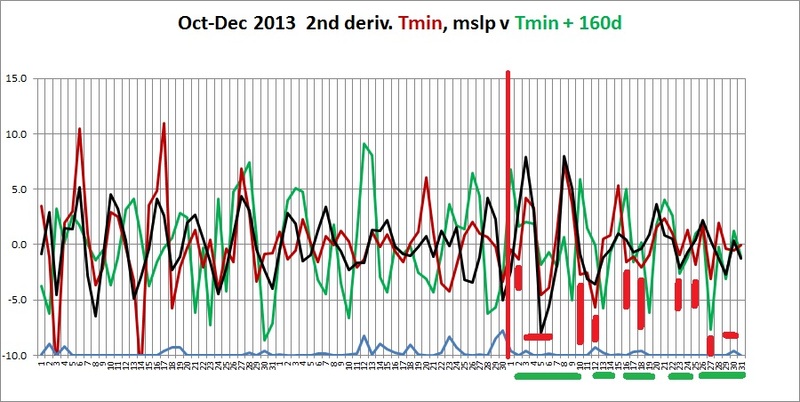 Again, minima has no immediate relation with rainfall (although cloudy nights are warmer), lagging many months behind. Next I calculate the difference in anomalies- surface temperature minus TLT- to analyse the difference between surface and satellite data. As minima lags many months behind rainfall a close relationship is not expected. However, Acorn maxima minus UAH matches rainfall remarkably well. Note that the surface- atmosphere difference tracks rainfall quite closely (+/- about 0.5C), with the largest positive and negative differences at the rainfall extremes, and also that the 12 month period where the rainfall anomaly crosses from negative to positive is at the 59th percentile: there are more dry months than wet months. Note the R squared value: 0.76! At least three quarters of the difference can be explained by rainfall variation alone- not bad across a whole continent with a northern wet summer / dry winter and a southern wet winter / dry summer pattern. In wetter than normal weather, more and thicker clouds reflect sunlight and shade the surface, keeping it cooler than normal. Moisture from the surface (and vegetation) is evaporated, also cooling the surface. Deep convective overturning occurs during the day and evaporated moisture ascends in the atmosphere, where it condenses, releasing heat. The troposphere anomaly is thus relatively warmer than the surface anomaly in moist conditions such as during wet weather. In a drought, fewer clouds allows more sunlight to heat the surface. The ground is dry; surface water is scarce; vegetation is thinner, drier, and shades less of the ground. Therefore the surface is hotter than normal. Less evaporated moisture means less condensation releasing heat in the troposphere, and therefore the troposphere anomaly will be relatively cooler than the surface anomaly. As well, as the Bureau explains, ” the rate at which temperatures cool with increasing altitude (known as the lapse rate) is greater in dry air than it is in moist air.” Thus in dry weather, ignoring convection, the atmosphere will be cooler than normal. So how does this explain why the October 2015 surface maximum anomaly was a record +3.08C above the 1981-2010 mean, while the UAH anomaly was a mere +0.71C, and the rainfall anomaly was only -12.75mm, nowhere near the lowest? This map shows the Normalised Difference Vegetation Index for October. The Bureau explains the index as a measure of “the fractional cover of the ground by vegetation, the vegetation density and the vegetation greenness”. Bare, dry dirt with scattered tussocks of dead grass- scattered prickly acacia in the distance. A large area of Australia is relatively bare and bone dry, therefore hotter. Over wide areas, much less moisture is convected into the atmosphere, which will thus be relatively cooler than surface anomalies. North winds blowing from the interior towards the south will bring hot dry air even to green areas, causing much hotter surface temperatures there as well. Much of the moisture evaporated from these wetter areas is blown out to sea (outside the UAH Australian grids) so the TLT over even these green areas is relatively cooler than expected. Atmospheric temperature anomalies are necessarily different from surface anomalies. Usually, atmospheric anomalies are less than surface maxima in hot periods and higher than surface anomalies in cool periods. There is no conspiracy: over three quarters of the difference between surface and atmospheric temperature anomalies is due to rainfall variation alone.